Welcome to the next installment in my ongoing push to dispel some of the myths I’m used to hearing about flooding in North Wayne. One of the big ones is that everybody knew the homes they bought were in flood zones, so the rest of us shouldn’t have to foot the bill to fix their problems. That argument fails for two reasons. First, the fact that there is a known hazard doesn’t mean that the Township doesn’t have an obligation to work to fix it. We pay, as a Township, for plenty of services that disproportionately benefit some residents over others. And, in the specific instance of the homes in North Wayne, the Township issued permits allowing them to be built, and then went on to permit development in other areas of the Township that increased the flooding problem in North Wayne. To me, this suggests an ongoing moral obligation to ensure that North Wayne remains safe and habitable. Second, and maybe more importantly, the majority of the affected properties were not in a FEMA flood zone when they were built or purchased. 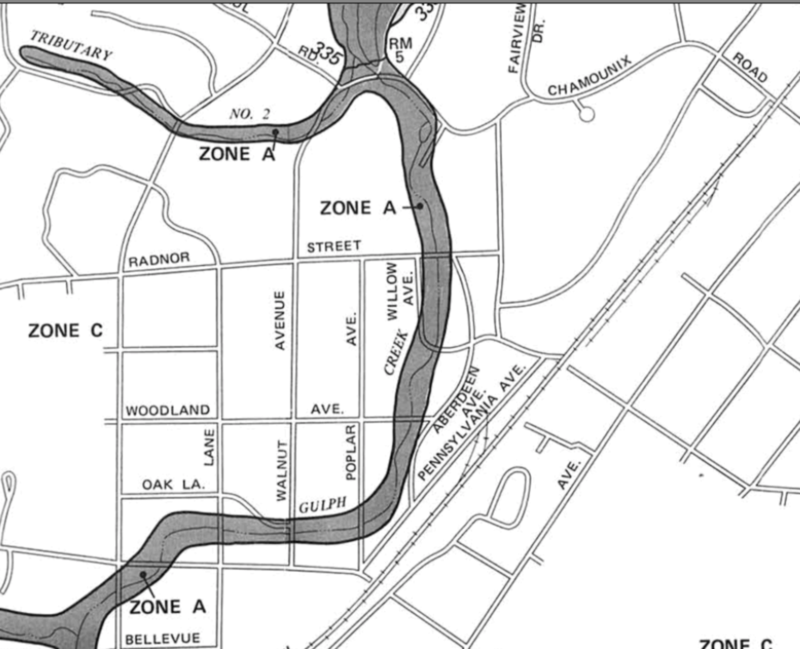 As the 1993 flood map shows above, only a few houses on Poplar lie within the 1993 FEMA “A” Zone. Plant Ave and the Northern portion of Willow Ave both appear to be largely unaffected. This map remained in place until 2009, when it was remapped to show a more extensive “A” Zone. There are residents living in affected areas today who purchased their homes before they were remapped into the “A” Zone. Further complicating matters, some residents purchased homes without receiving disclosures from prior owners that the property was affected by flooding, meaning that while they might, technically, have been aware that their home was in a ‘flood zone,’ they were wrongly led to believe that flooding was infrequent and minor. The long and short of the situation is that few, if any, residents actually knew that their homes would be affected by severe and regular flooding when they purchased them. Pretending that our neighbors and friends are getting their ‘just desserts’ after buying in a ‘flood zone’ is both callous and incorrect.